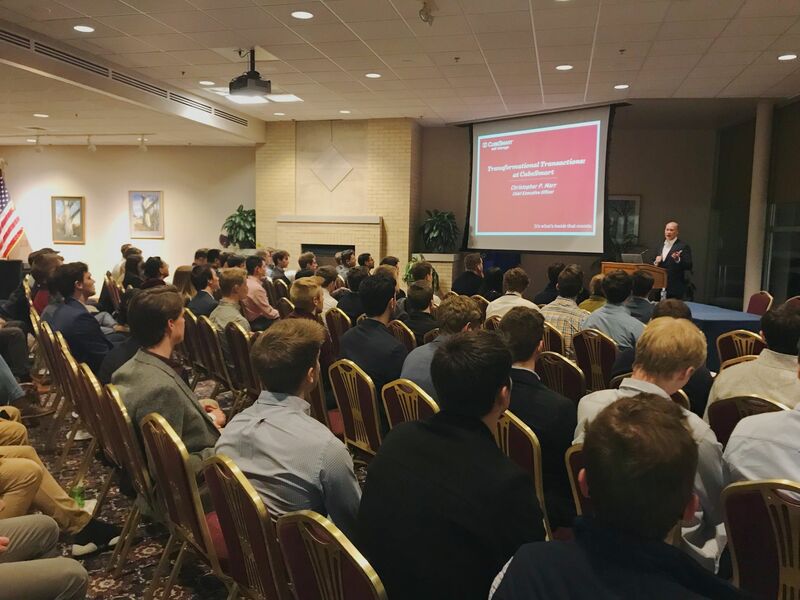 The Real Estate Club kicked off the Spring Semester with an insightful and interactive presentation by Christopher P. Marr, the CEO of CubeSmart, a publicly-traded self-storage REIT. With over 20 years of real estate investment trust executive management experience, Mr. Marr began his career at CubeSmart as Chief Financial Officer and Treasurer in 2006 and was responsible for the successful repositioning of the Company’s portfolio after the Great Recession. He later assumed the roles of President, Chief Investment Officer, and Chief Operating Officer before assuming his current role as CEO in 2014. Mr. Marr gave the Club an overview of the self-storage industry, an asset class that he believes will continue to evolve to become one of the core investment classes of the future. He discussed many aspects of CubeSmart’s product and presence in the real estate industry, its large customer base and growing demand on a national level, as well as its ability to withhold high investor returns in both a boom and bust economy. Mr. Marr shared CubeSmart’s initiatives to continue to evolve and adapt, specifically in transformational transactions as they relate to recycling and environmentally-conscious decisions. Mr. Marr’s presentation was collaborative and engaging; he would often pause and open the floor for questions by students and attendees. He was able to simplify the operations of CubeSmart, the sector’s third largest publicly-traded REIT, into a comprehensive demonstration for undergraduate and graduate students to understand. To conclude his presentation, Mr. Marr offered his four “keys to being successful,” in both the real estate industry and in life. He told students to “1. Be optimistic 2. Take risks 3. Have Resilience and 4. Make Lasting Connections.” He applauded the Wisconsin Real Estate program for its emphasis on keeping connections throughout the industry. Students of the Real Estate Club enjoyed having Mr. Marr in Wisconsin to share his experiences and insights into the industry. The Club’s next meeting with be Thursday, February 16th.